Stretching from Corolla to Ocracoke North Carolina, the Outer Banks span 200-miles along North Carolina's coast, and are comprised of a string of barrier islands connected to the mainland by bridges and ferries. Like any popular island vacation mecca, the Outer Banks boast all the modern bells and whistles: lively shops, fine restaurants, fun nightlife, and kid-friendly attractions. But it's the Outer Banks' rustic and untamed side, as much as any of its amenities, that attract vacationers each year. Windswept beaches, wild horses, historic sites, and pristine maritime forests beckon visitors to get out and explore. Dubbed "The Graveyard of the Atlantic," the Outer Banks' waters have claimed hundreds of shipwrecks, from pirate rigs to Spanish galleons. It was from one of these wrecks, centuries ago, that the area's famous wild horses of Carova are thought to have first come ashore. Thanks to numerous OBX lighthouses and modern-day technology, shipwrecks are largely a thing of the past, but the two thousand known ships permanently entombed here now make for incredible scuba diving and fishing adventures. Just 12 miles off the coast, the warm waters of the Gulf Stream rub elbows with colder Atlantic currents to create one of the most fertile estuaries on the Eastern seaboard. Fishermen flock to the Outer Banks from all over the world, eager to reel in mackerel, cobia, bluefish, tuna, and other monster trophies that swim these waters. A number of Outer Banks marinas and fishing piers cater to the crowds with charters, bait, tackle, and all the necessities. The Atlantic's fierce currents have also created a bounty of wide sand beaches in the Outer Banks, which draw thousands of sun worshippers annually for swimming, sunbathing, paddleboarding, and surfing. A large portion of the Outer Banks has been designated as National Seashore, to preserve the fragile sand dunes, salt marshes, and tranquil woodlands that line the coast. On any given day beachgoers might spot a rare seabird or a nesting sea turtle. Bike paths and nature trails wind through the islands, allowing cyclists, joggers, birdwatchers, and other outdoorsy types to explore the rugged terrain. Visitors can also soak up the scenery at a number of top-rated golf courses on the islands, including the Nags Head Golf Links, with several holes that finish on the Roanoke Sound. The Outer Banks are a series of barrier islands made up entirely of sand (undersea sand bars). There is no fee to access any of our beaches. The Outer Banks is a favorite destination for families…and for good reason. 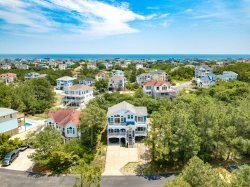 Besides relaxing on our beautiful pristine beaches and delighting in our savory local seafood, there are some fantastic things to do on the Outer Banks - and some fantastic places to stay. View our selection of outer banks rentals to get started on your own OBX story.